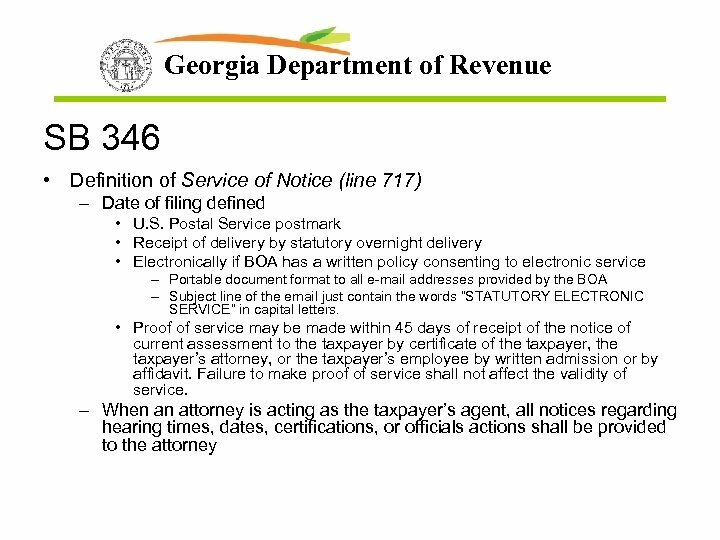 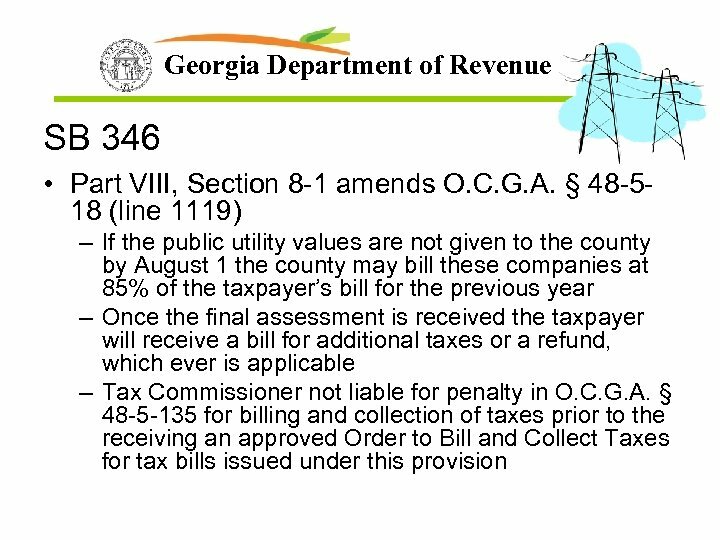 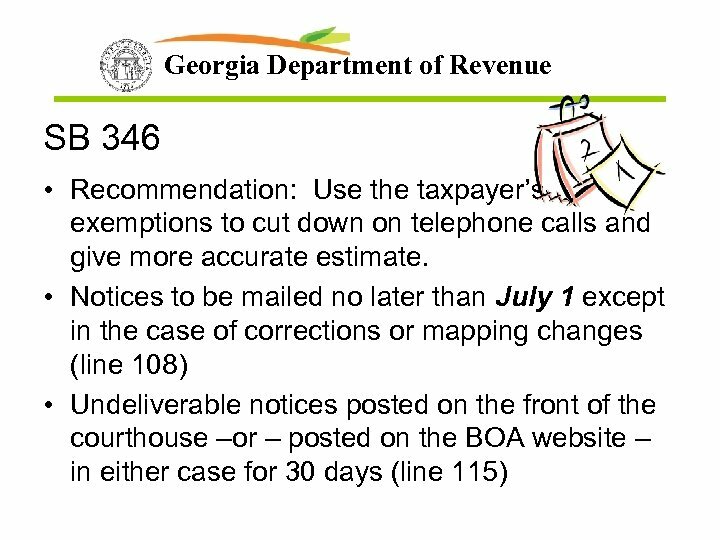 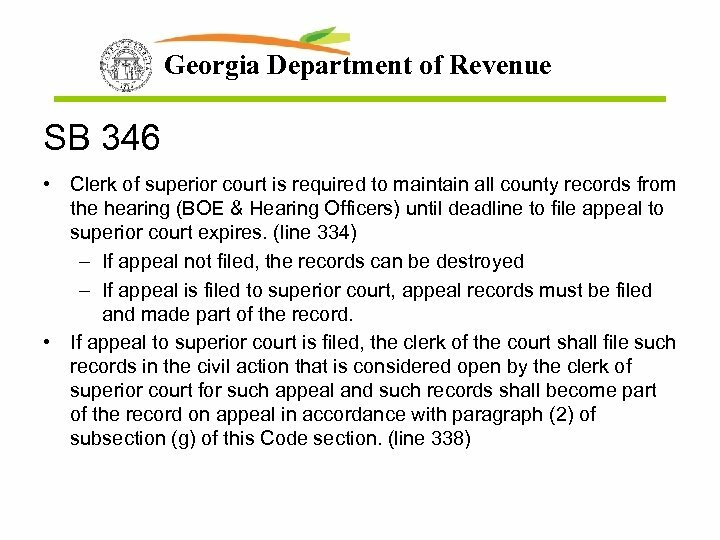 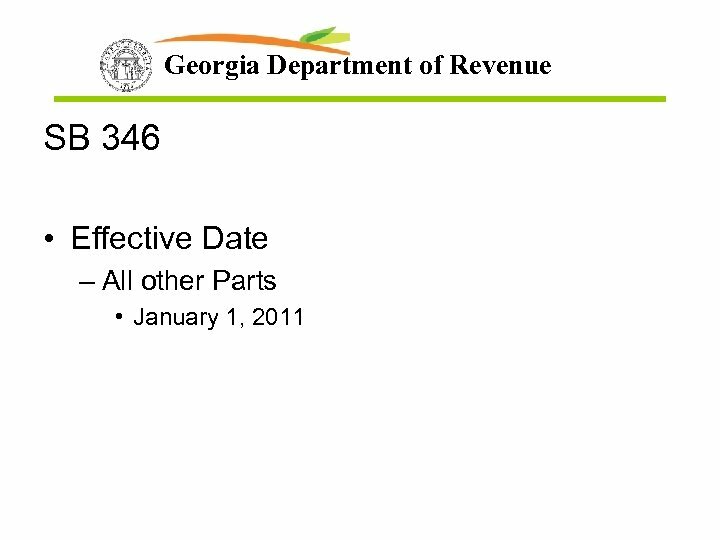 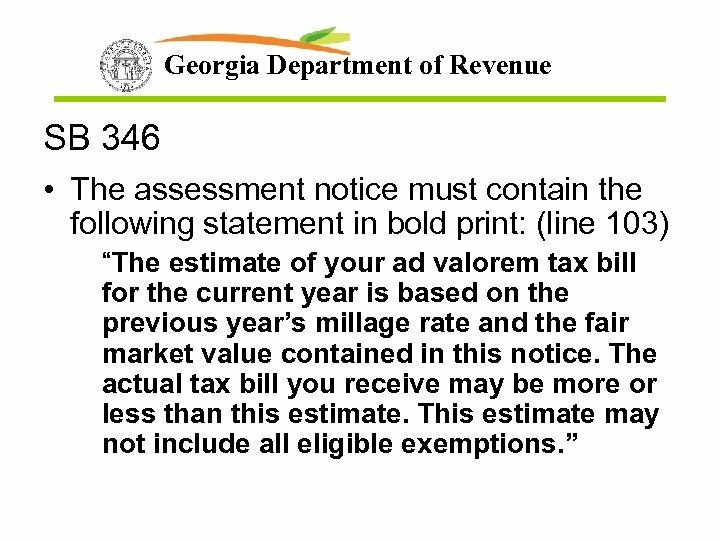 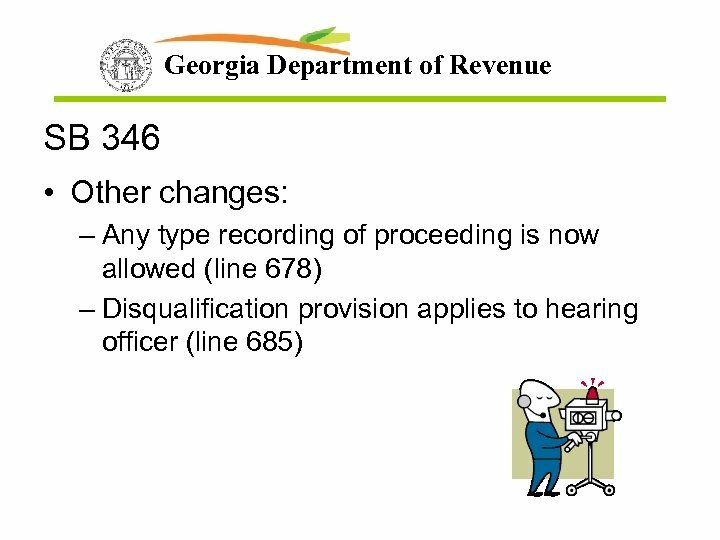 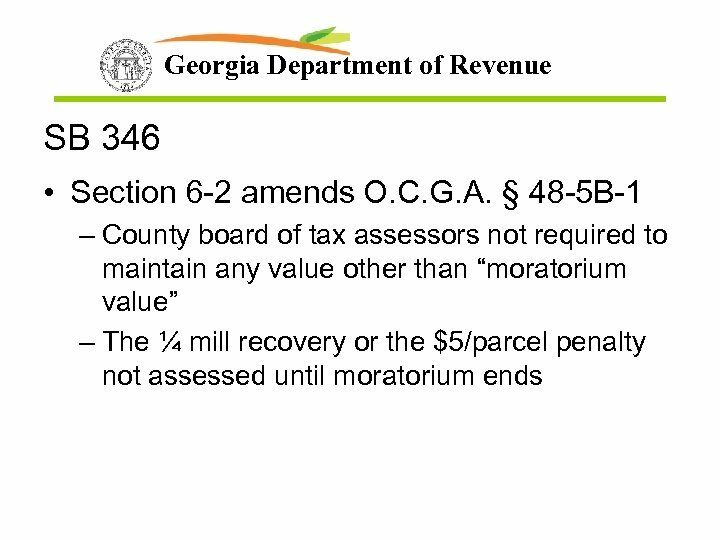 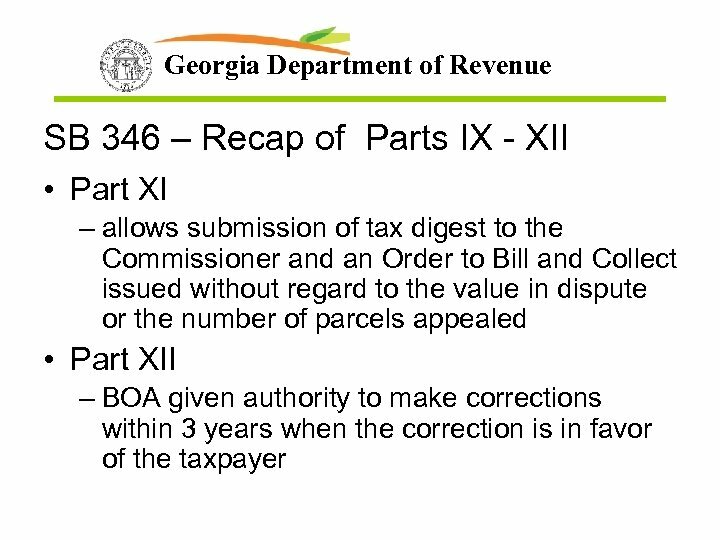 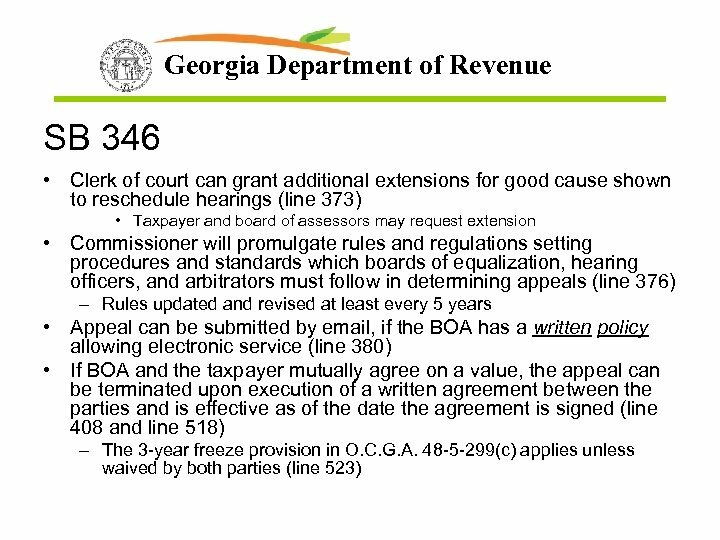 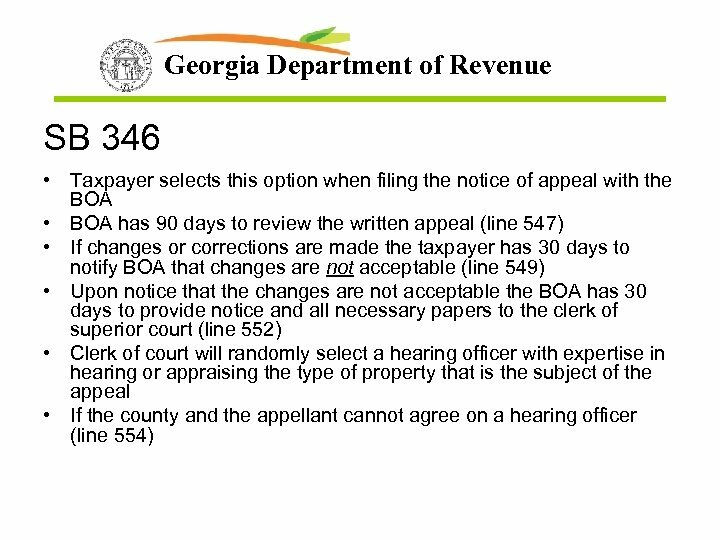 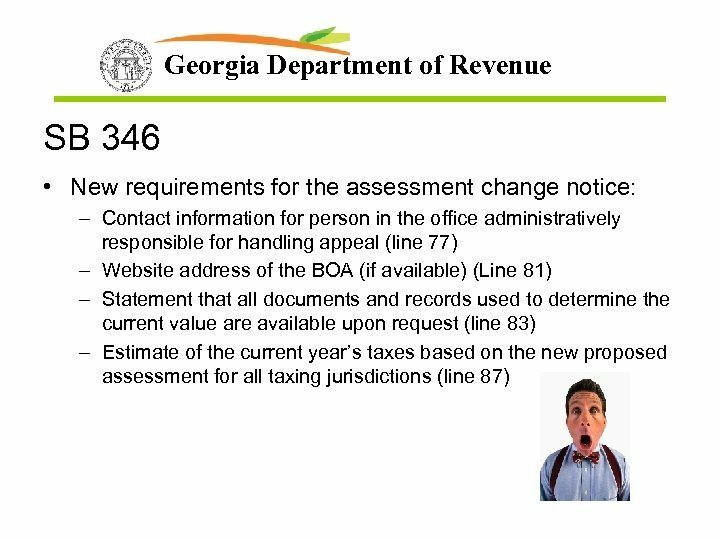 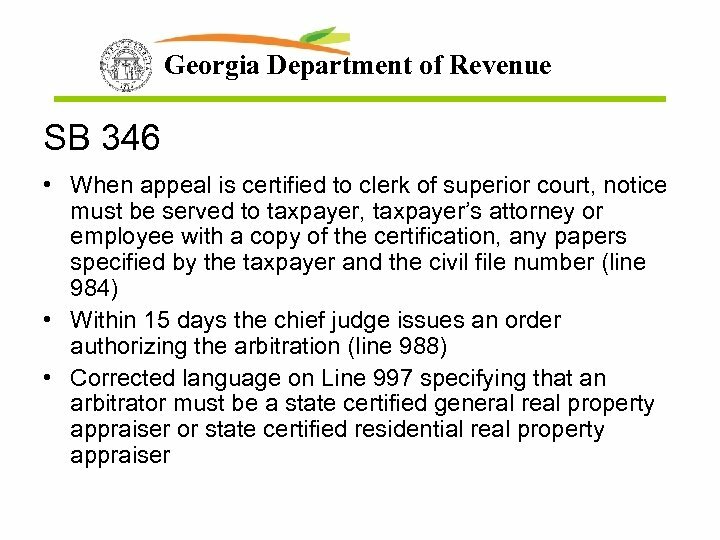 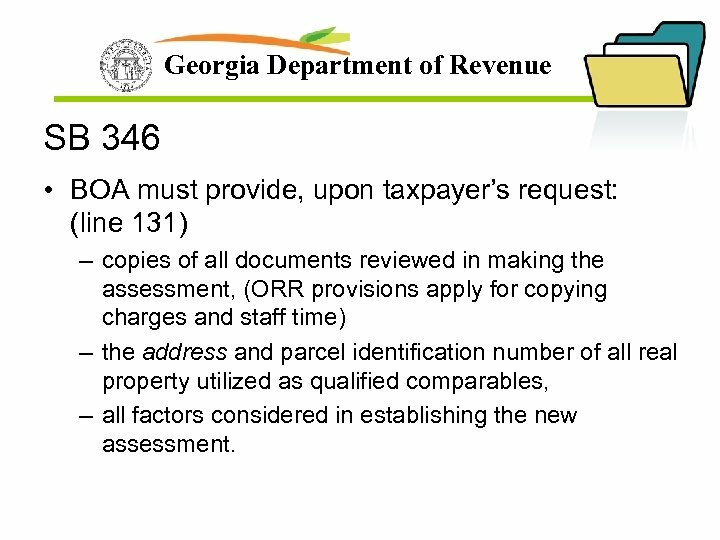 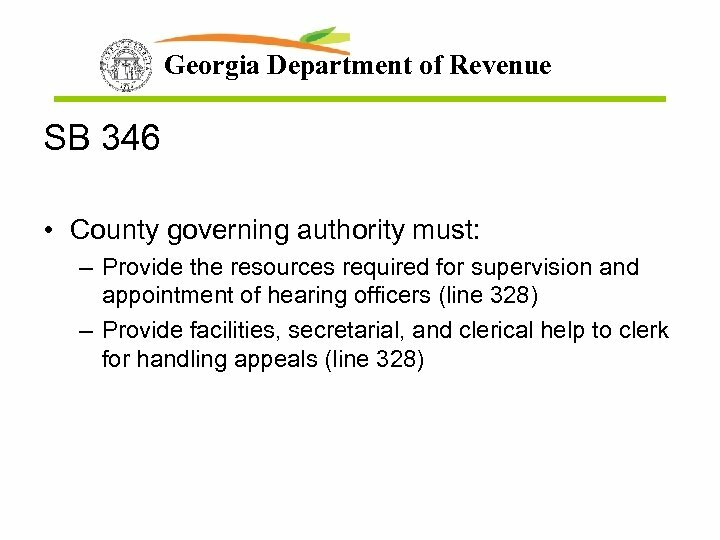 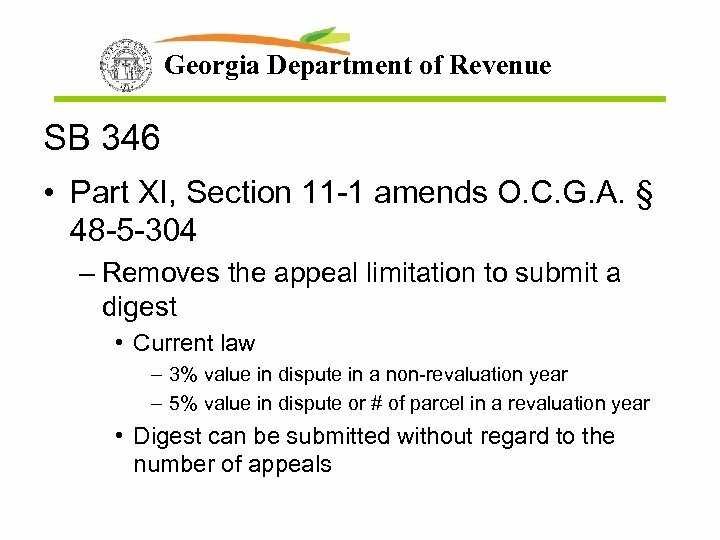 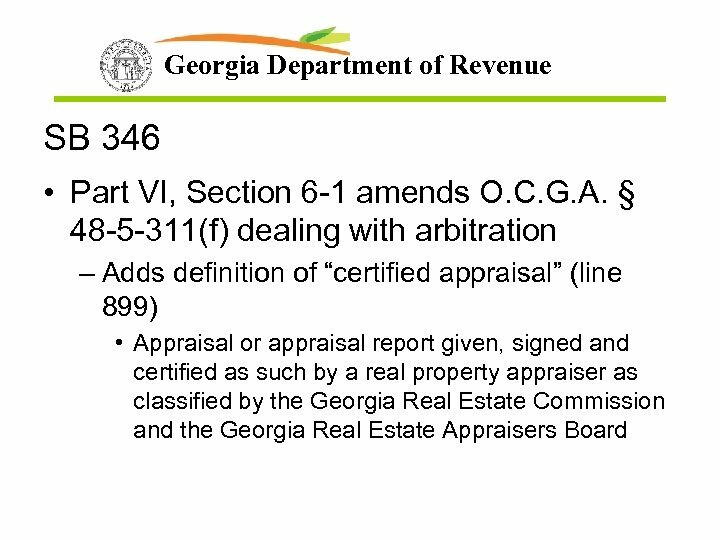 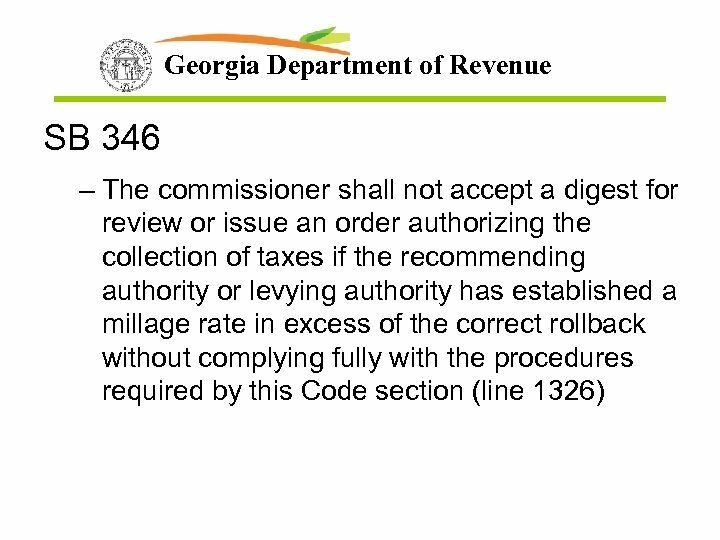 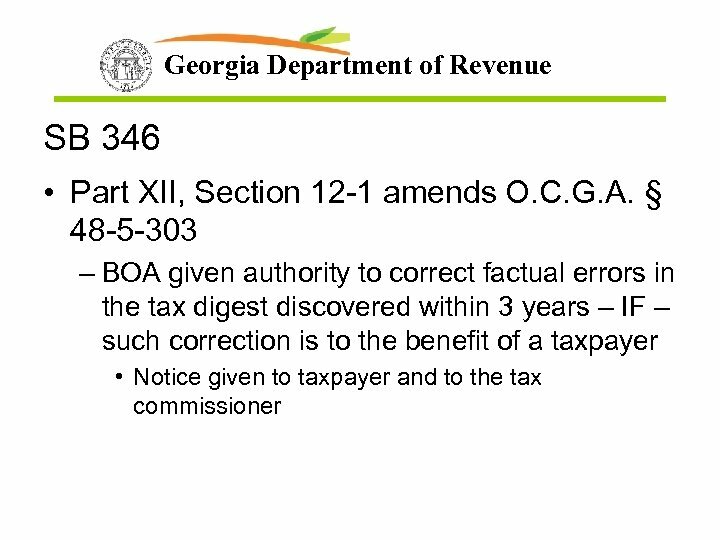 Georgia Department of Revenue SB 346 • BOA must provide, upon taxpayer’s request: (line 131) – copies of all documents reviewed in making the assessment, (ORR provisions apply for copying charges and staff time) – the address and parcel identification number of all real property utilized as qualified comparables, – all factors considered in establishing the new assessment. 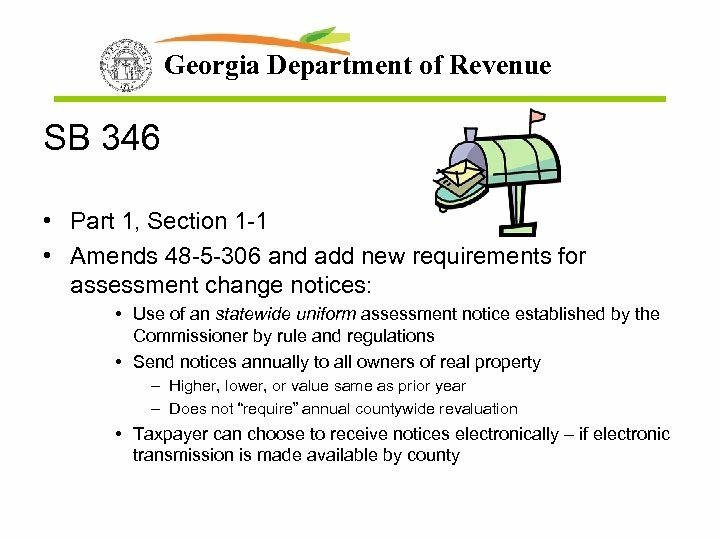 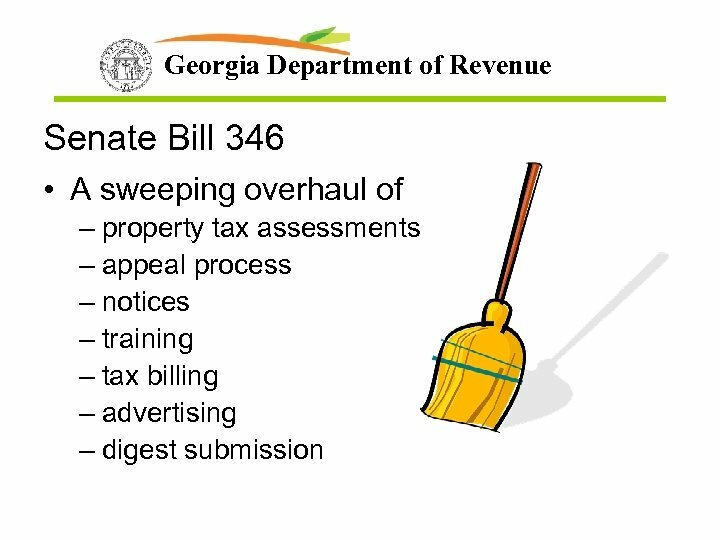 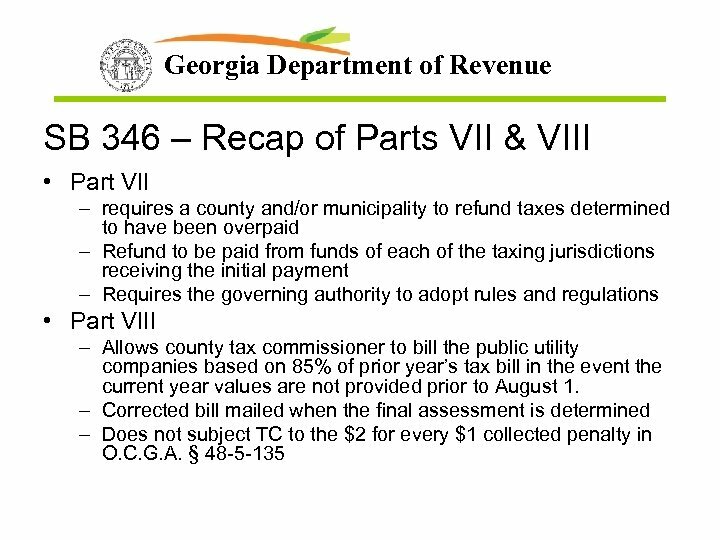 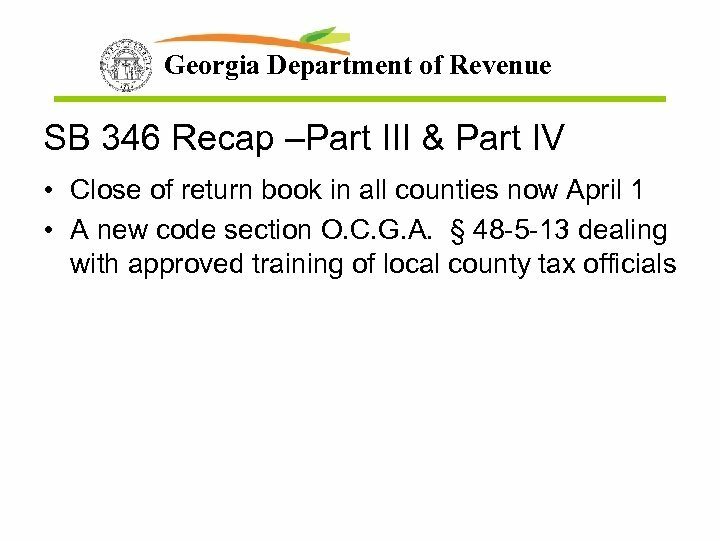 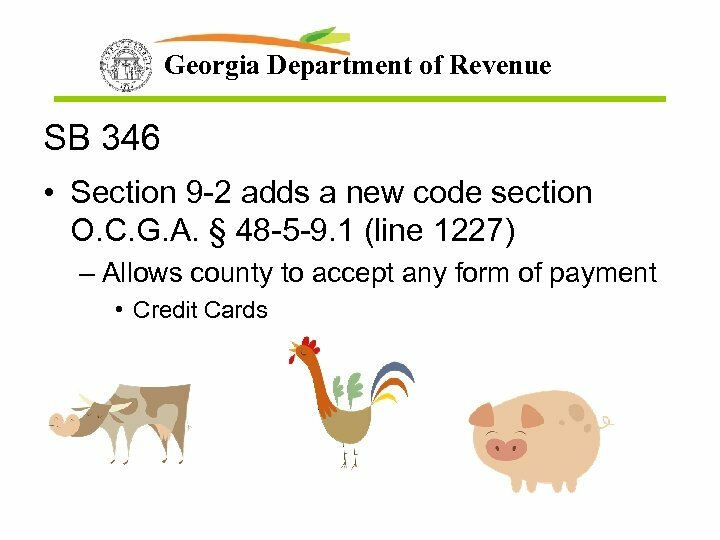 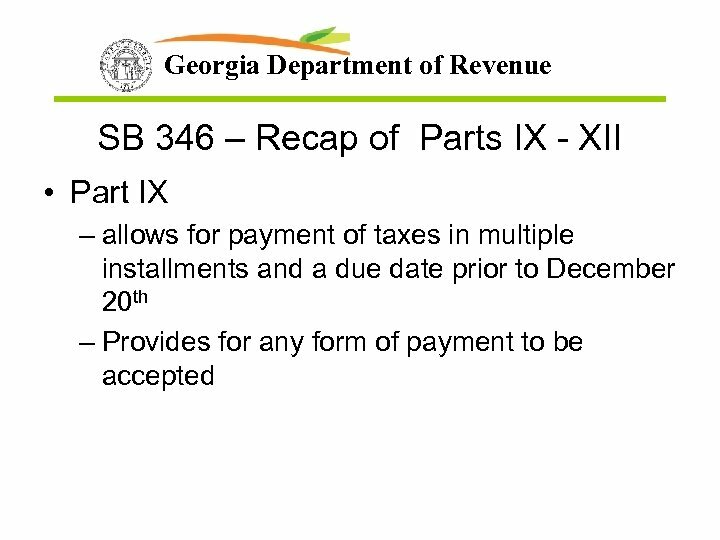 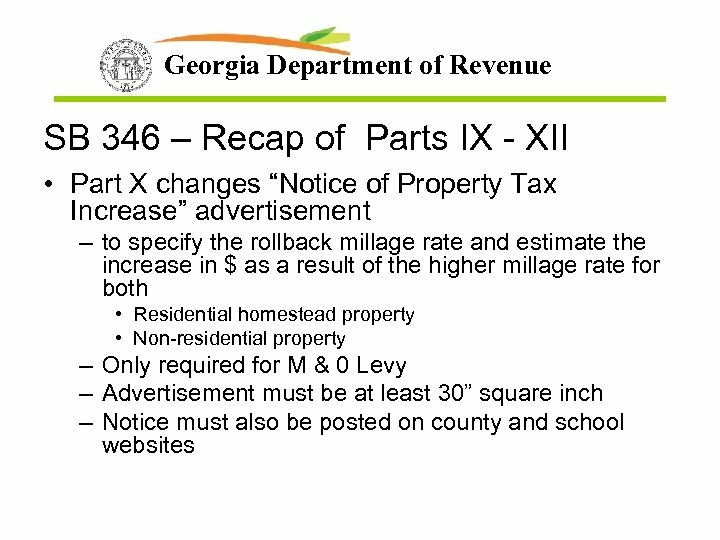 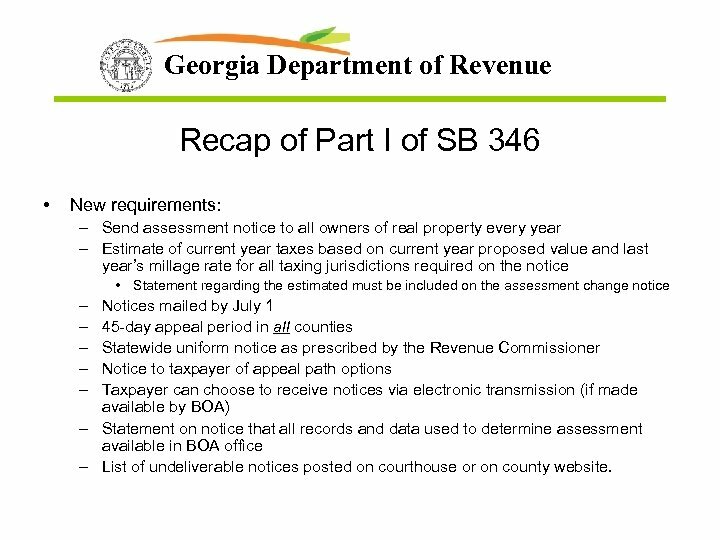 Georgia Department of Revenue Recap of Part I of SB 346 • New requirements: – Send assessment notice to all owners of real property every year – Estimate of current year taxes based on current year proposed value and last year’s millage rate for all taxing jurisdictions required on the notice • Statement regarding the estimated must be included on the assessment change notice – – – Notices mailed by July 1 45 -day appeal period in all counties Statewide uniform notice as prescribed by the Revenue Commissioner Notice to taxpayer of appeal path options Taxpayer can choose to receive notices via electronic transmission (if made available by BOA) – Statement on notice that all records and data used to determine assessment available in BOA office – List of undeliverable notices posted on courthouse or on county website. 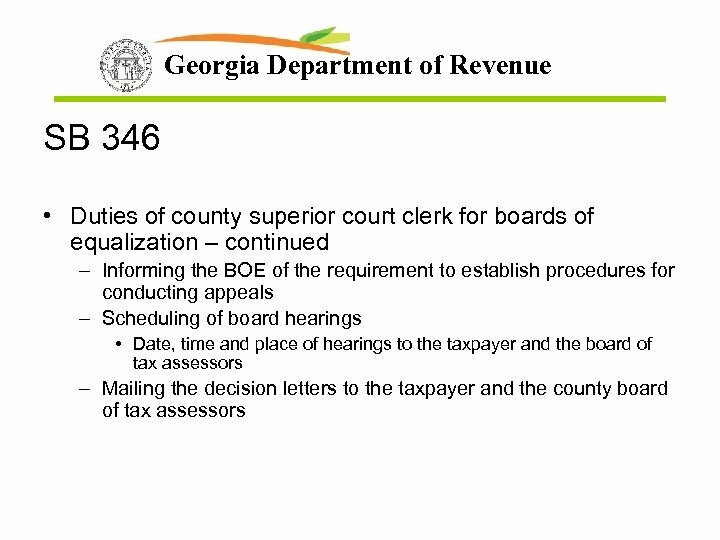 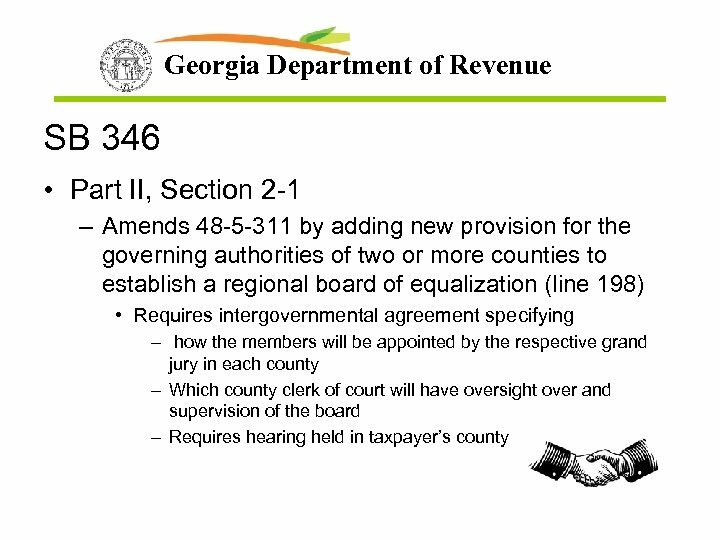 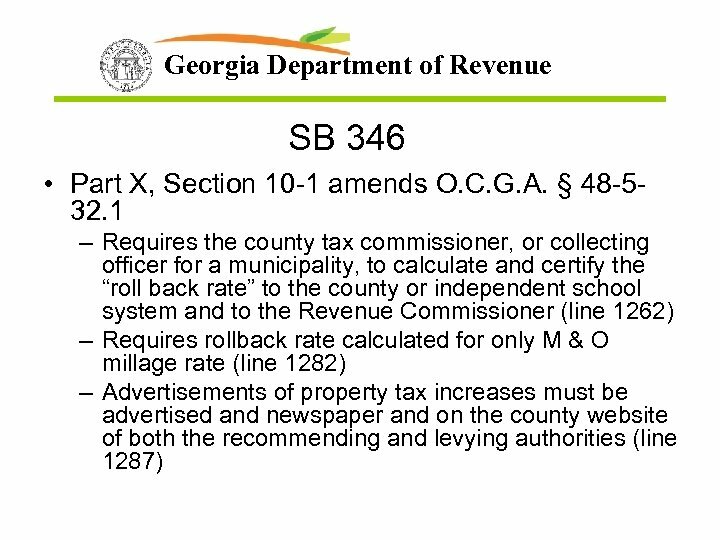 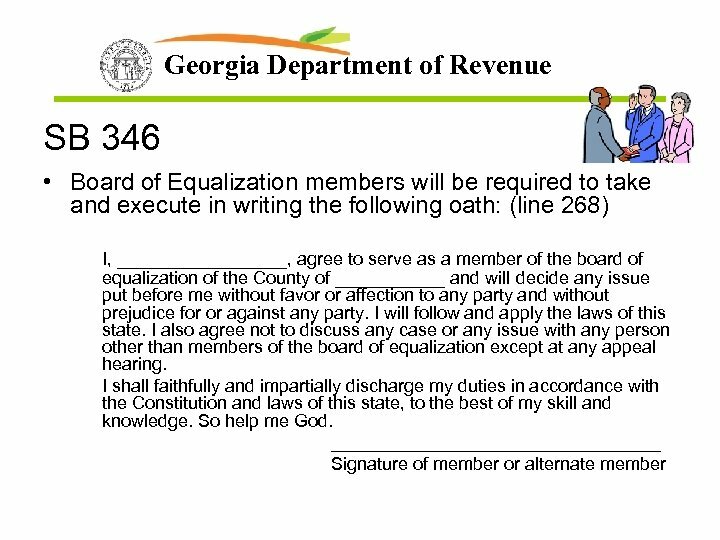 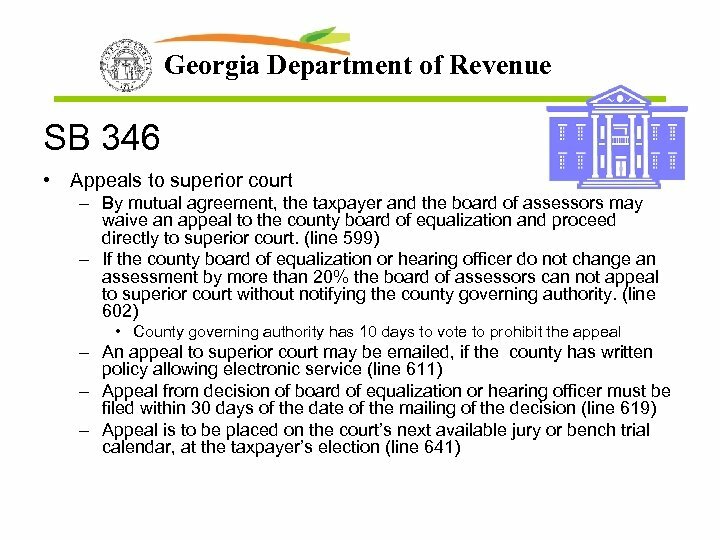 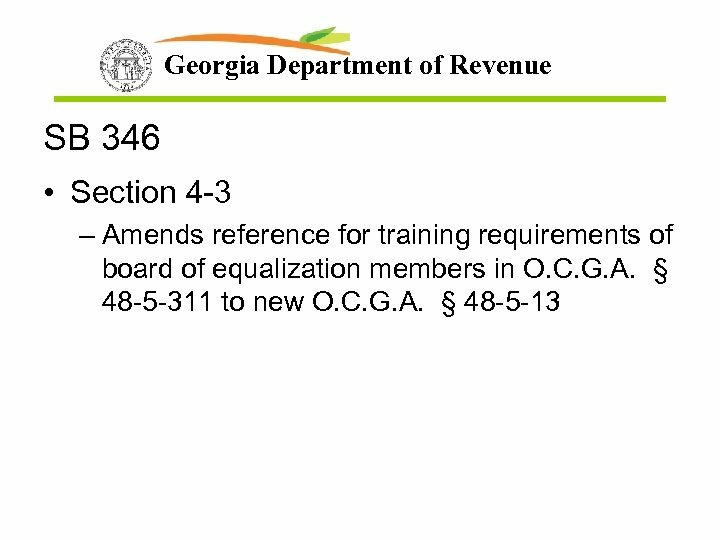 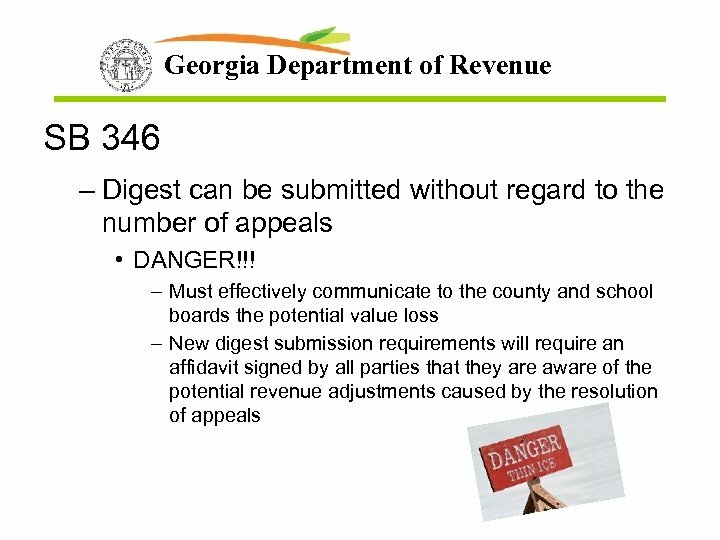 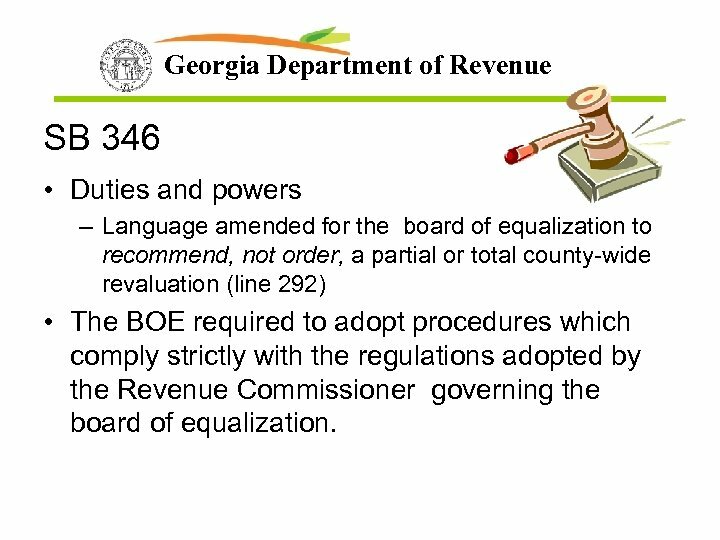 Georgia Department of Revenue SB 346 • Duties and powers – Language amended for the board of equalization to recommend, not order, a partial or total county-wide revaluation (line 292) • The BOE required to adopt procedures which comply strictly with the regulations adopted by the Revenue Commissioner governing the board of equalization. 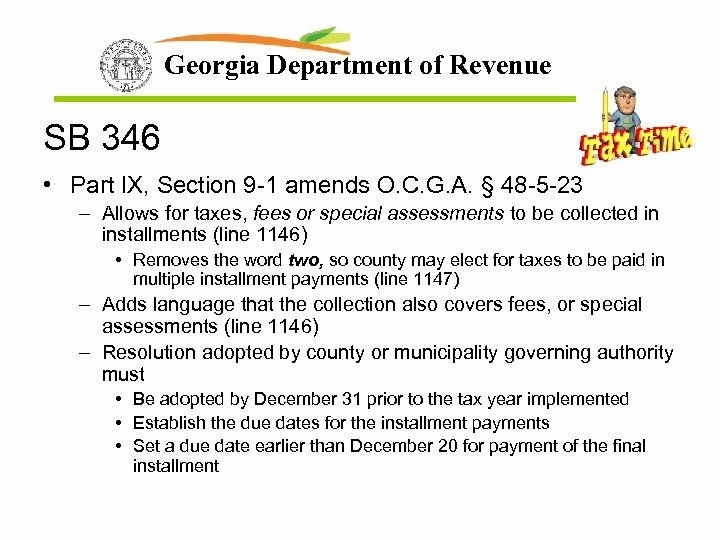 Georgia Department of Revenue 15 -12 -81. 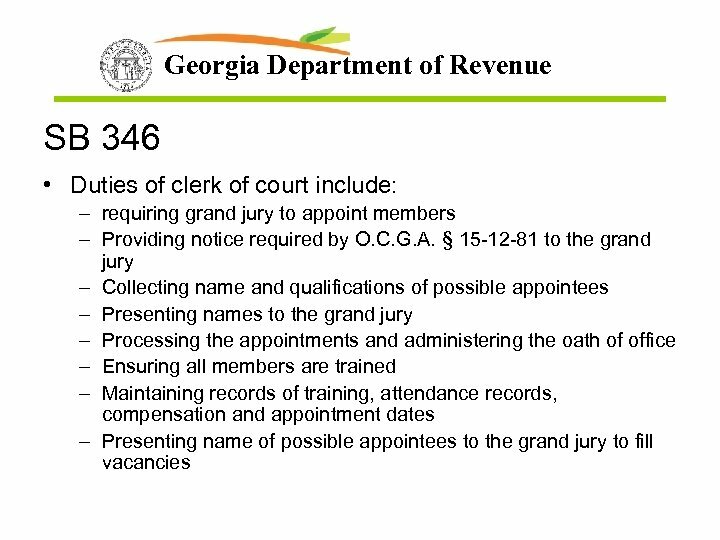 Notice of upcoming appointment by grand jury. 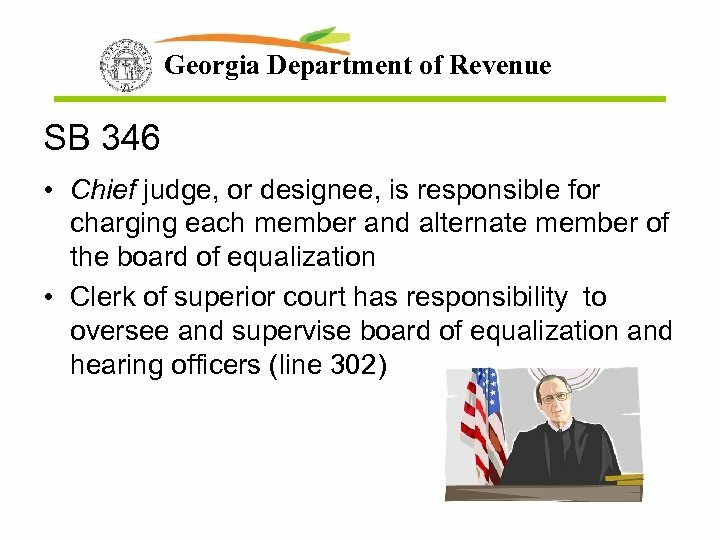 (a) Whenever it is provided by law that the grand jury of any county shall elect, select, or appoint any person to any office, notice thereof shall be given in the manner provided in subsection (b) of this Code section. 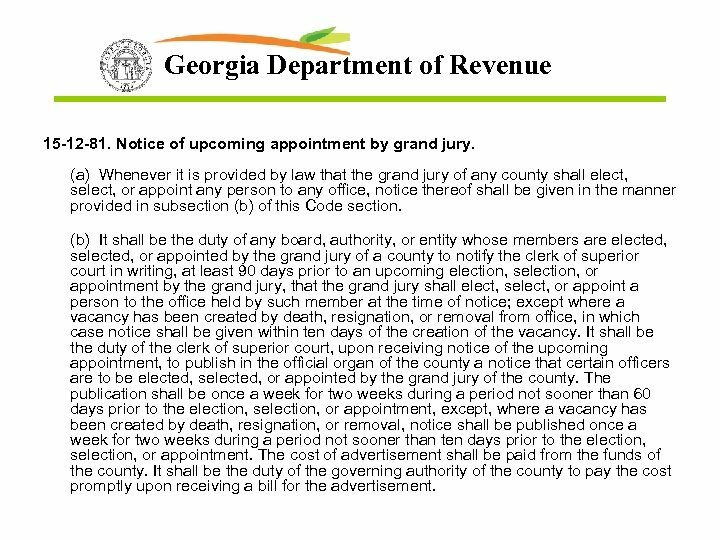 (b) It shall be the duty of any board, authority, or entity whose members are elected, selected, or appointed by the grand jury of a county to notify the clerk of superior court in writing, at least 90 days prior to an upcoming election, selection, or appointment by the grand jury, that the grand jury shall elect, select, or appoint a person to the office held by such member at the time of notice; except where a vacancy has been created by death, resignation, or removal from office, in which case notice shall be given within ten days of the creation of the vacancy. 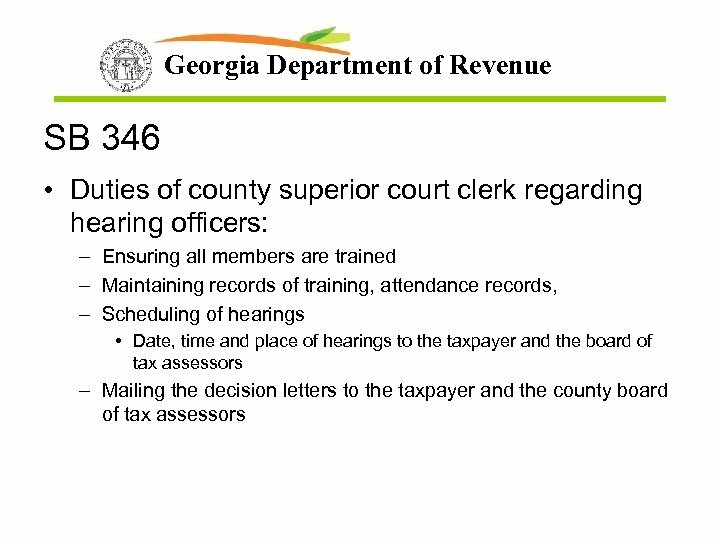 It shall be the duty of the clerk of superior court, upon receiving notice of the upcoming appointment, to publish in the official organ of the county a notice that certain officers are to be elected, selected, or appointed by the grand jury of the county. 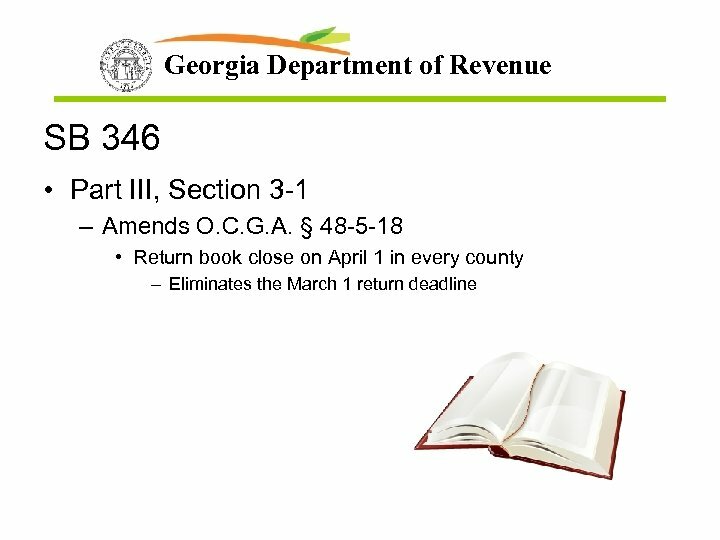 The publication shall be once a week for two weeks during a period not sooner than 60 days prior to the election, selection, or appointment, except, where a vacancy has been created by death, resignation, or removal, notice shall be published once a week for two weeks during a period not sooner than ten days prior to the election, selection, or appointment. 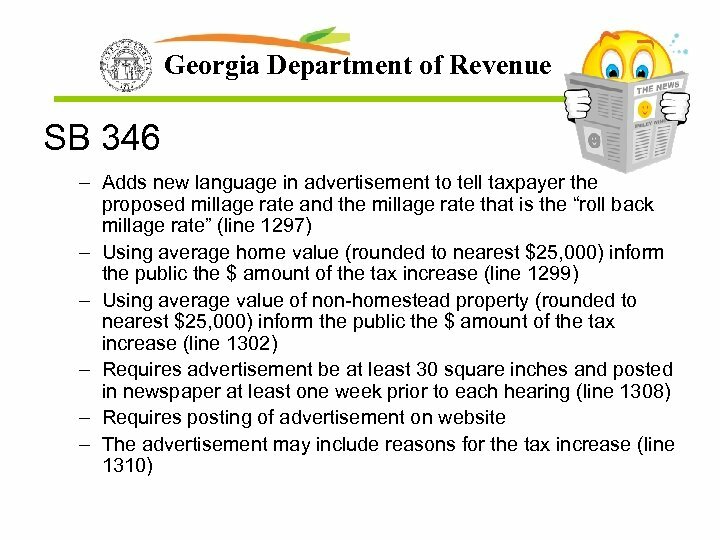 The cost of advertisement shall be paid from the funds of the county. 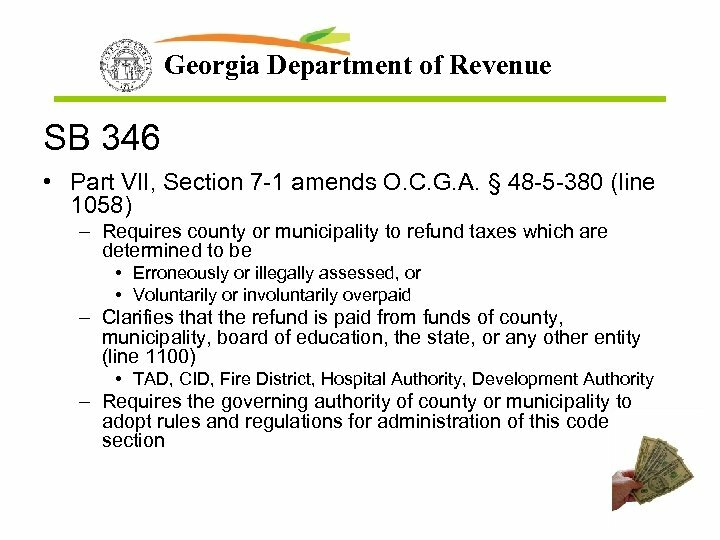 It shall be the duty of the governing authority of the county to pay the cost promptly upon receiving a bill for the advertisement. 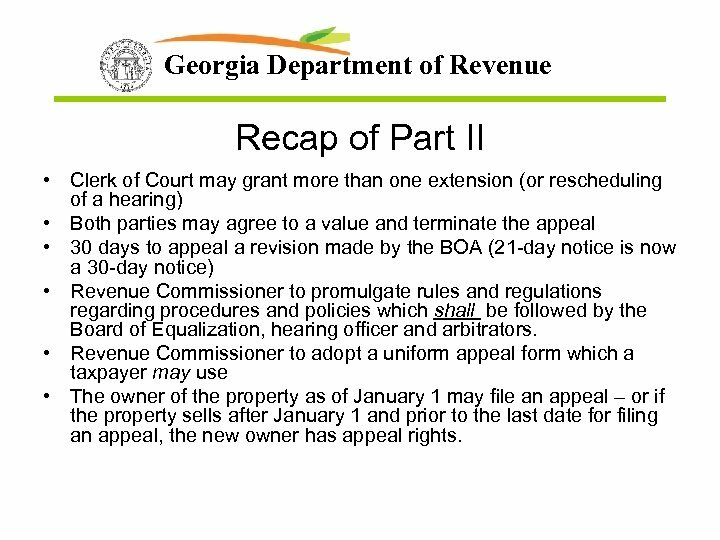 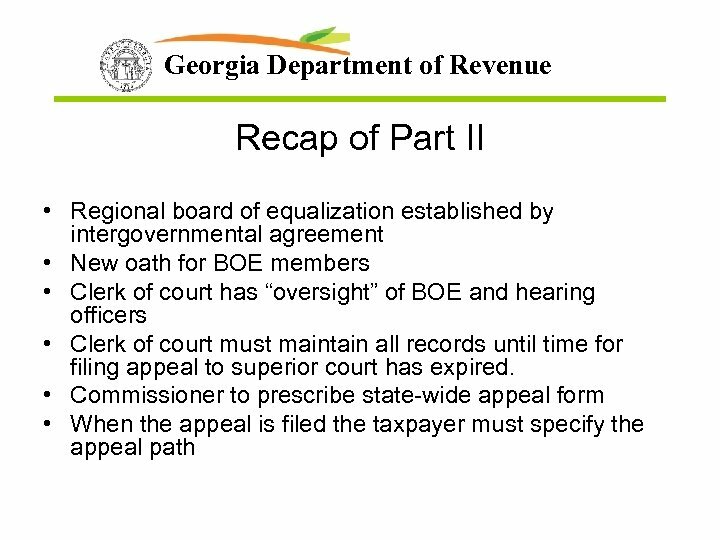 Georgia Department of Revenue Recap of Part II • Clerk of Court may grant more than one extension (or rescheduling of a hearing) • Both parties may agree to a value and terminate the appeal • 30 days to appeal a revision made by the BOA (21 -day notice is now a 30 -day notice) • Revenue Commissioner to promulgate rules and regulations regarding procedures and policies which shall be followed by the Board of Equalization, hearing officer and arbitrators. 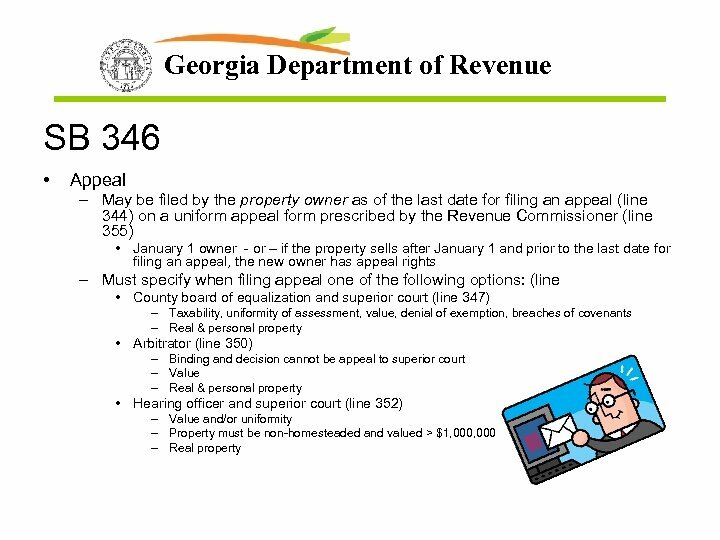 • Revenue Commissioner to adopt a uniform appeal form which a taxpayer may use • The owner of the property as of January 1 may file an appeal – or if the property sells after January 1 and prior to the last date for filing an appeal, the new owner has appeal rights. 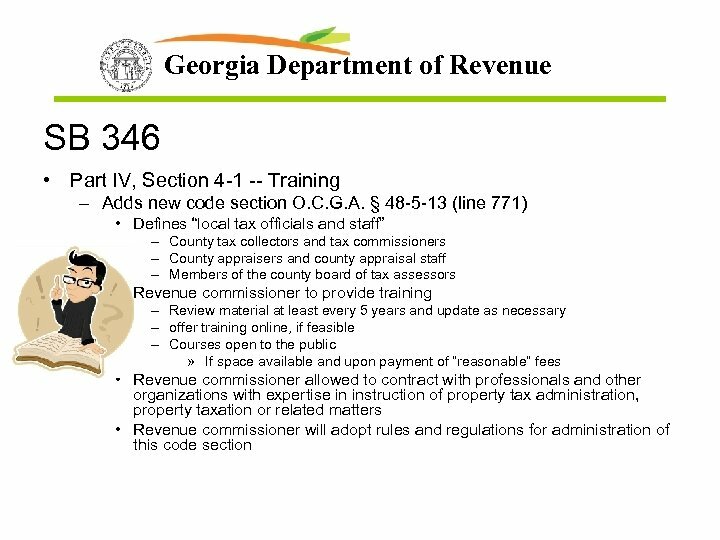 Georgia Department of Revenue SB 346 • Compensation paid at the rate of not less than $25/hour. 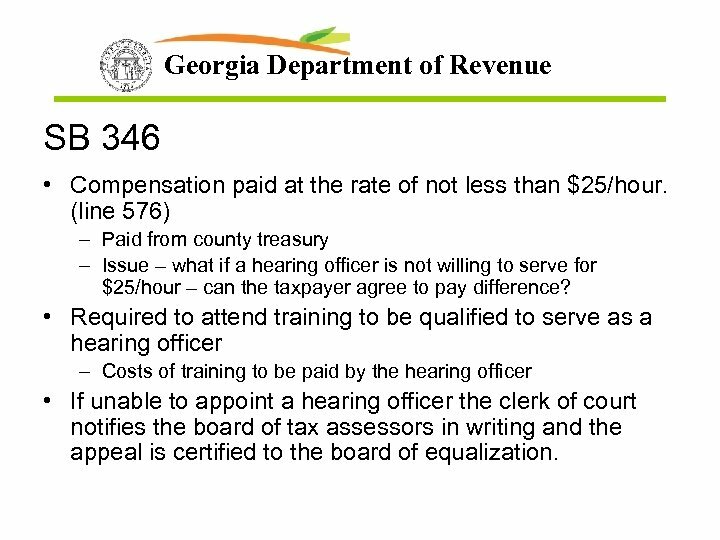 (line 576) – Paid from county treasury – Issue – what if a hearing officer is not willing to serve for $25/hour – can the taxpayer agree to pay difference? 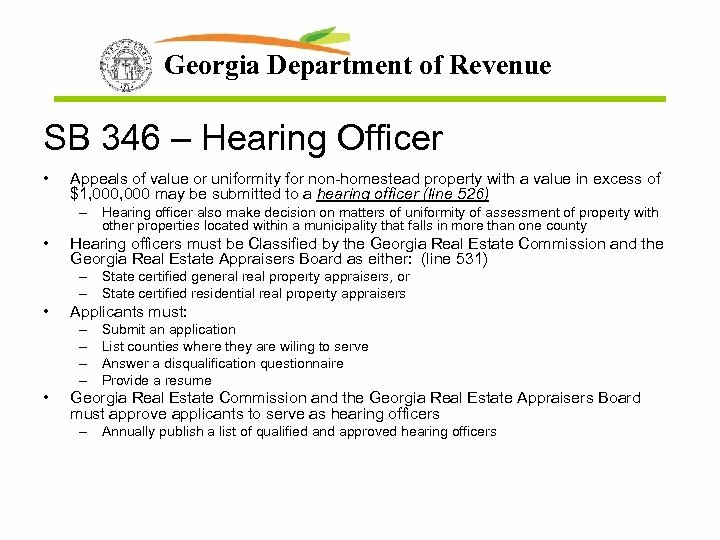 • Required to attend training to be qualified to serve as a hearing officer – Costs of training to be paid by the hearing officer • If unable to appoint a hearing officer the clerk of court notifies the board of tax assessors in writing and the appeal is certified to the board of equalization. 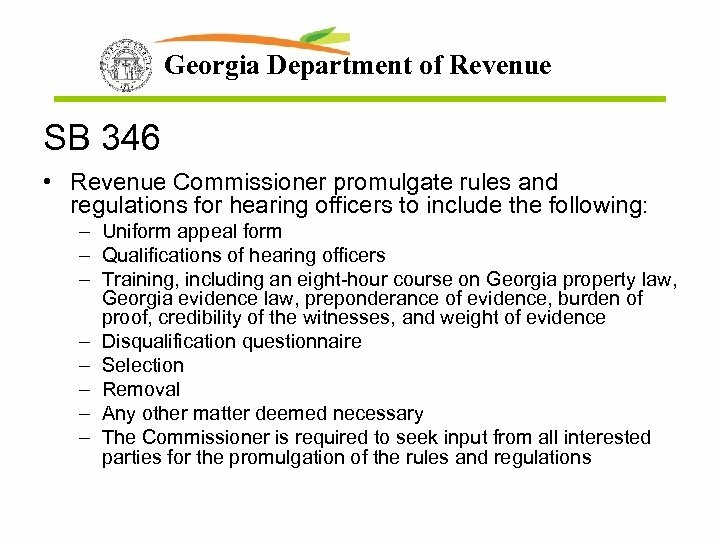 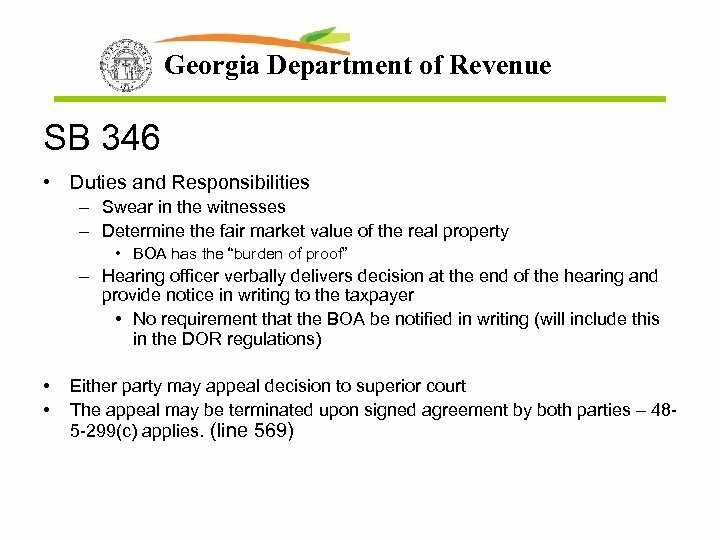 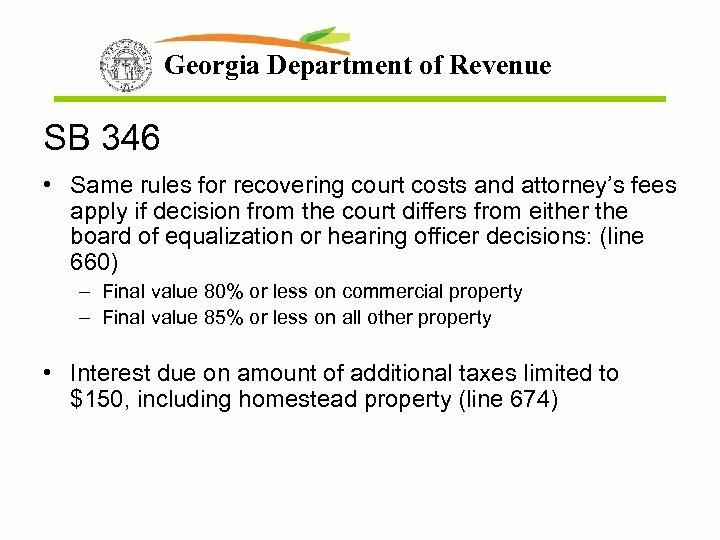 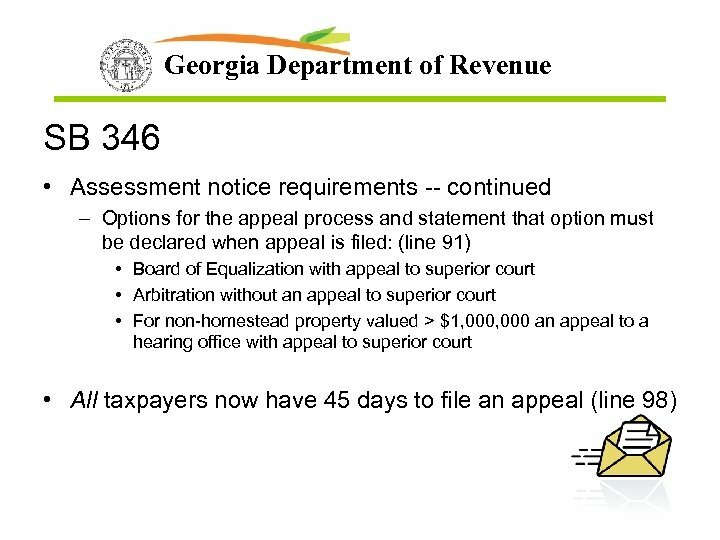 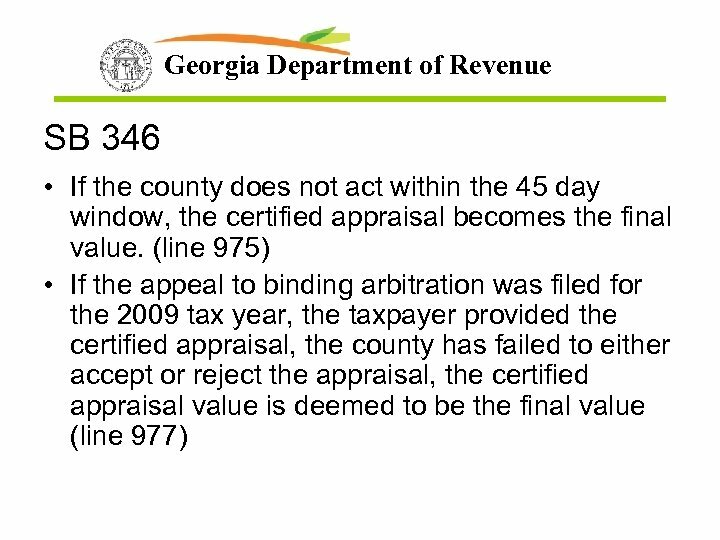 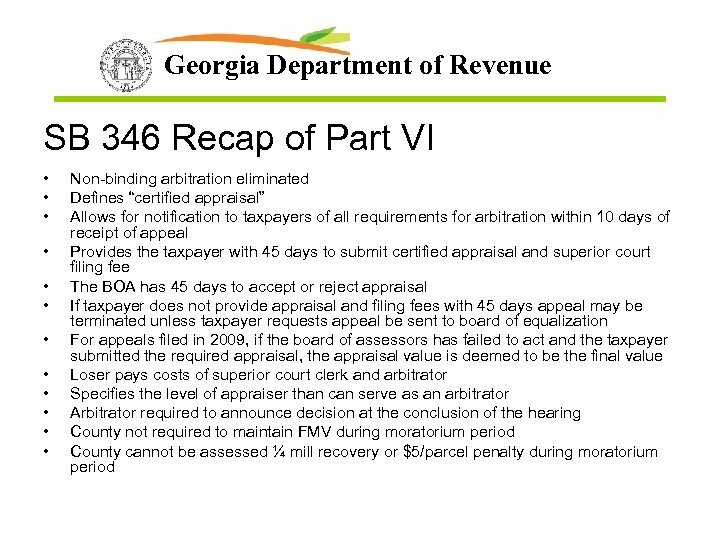 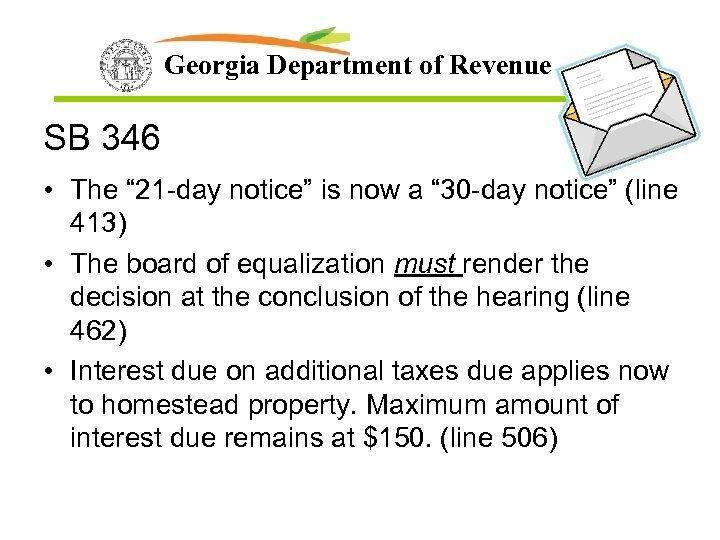 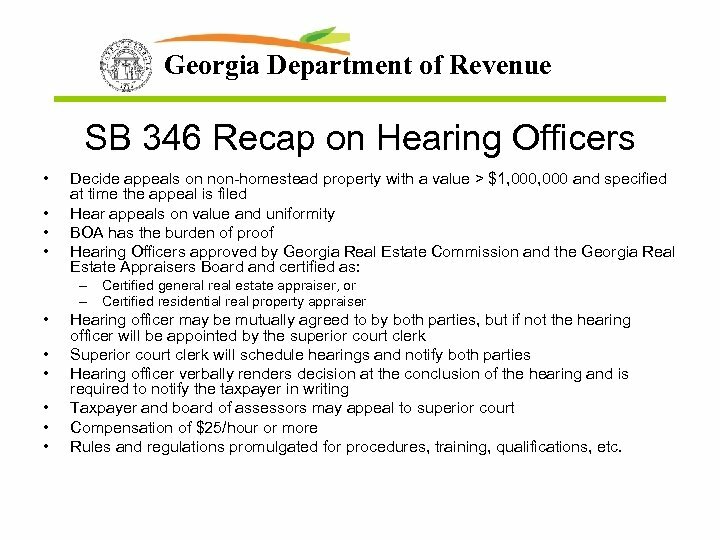 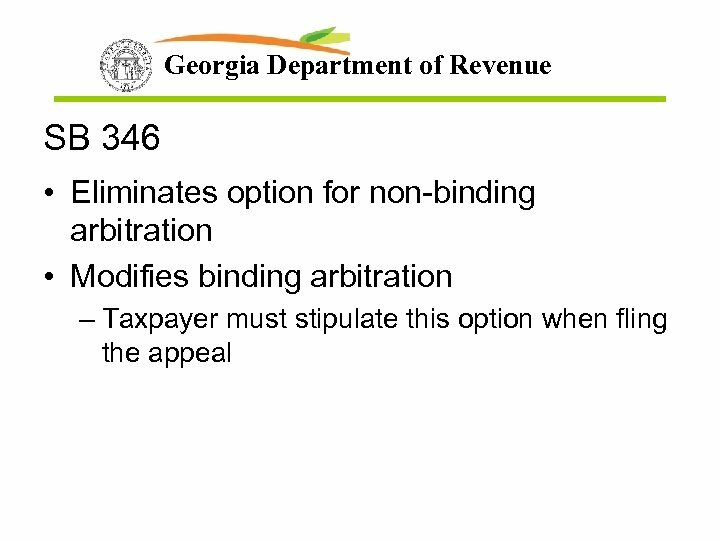 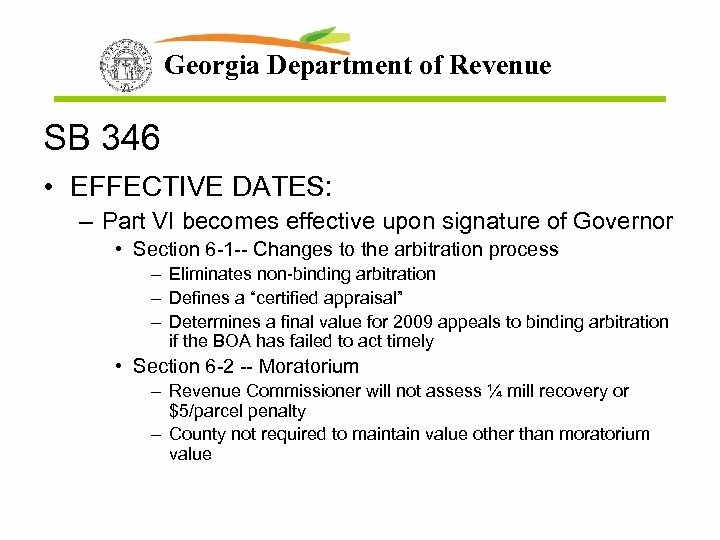 Georgia Department of Revenue SB 346 Recap on Hearing Officers • • Decide appeals on non-homestead property with a value > $1, 000 and specified at time the appeal is filed Hear appeals on value and uniformity BOA has the burden of proof Hearing Officers approved by Georgia Real Estate Commission and the Georgia Real Estate Appraisers Board and certified as: – Certified general real estate appraiser, or – Certified residential real property appraiser • • • Hearing officer may be mutually agreed to by both parties, but if not the hearing officer will be appointed by the superior court clerk Superior court clerk will schedule hearings and notify both parties Hearing officer verbally renders decision at the conclusion of the hearing and is required to notify the taxpayer in writing Taxpayer and board of assessors may appeal to superior court Compensation of $25/hour or more Rules and regulations promulgated for procedures, training, qualifications, etc. 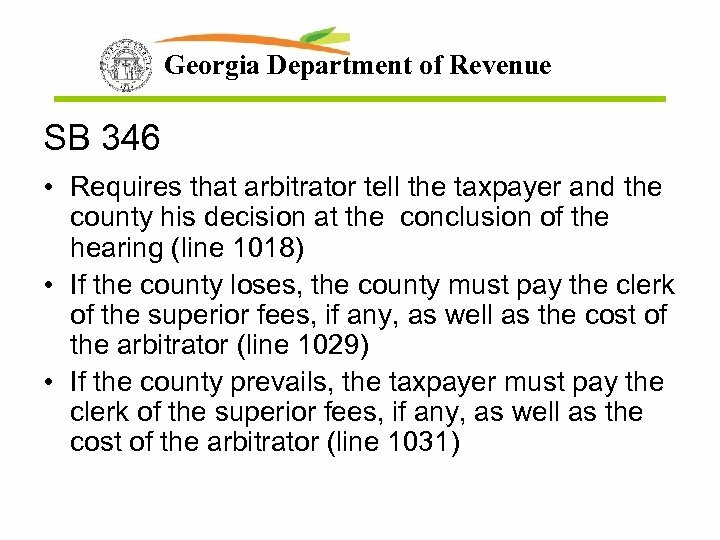 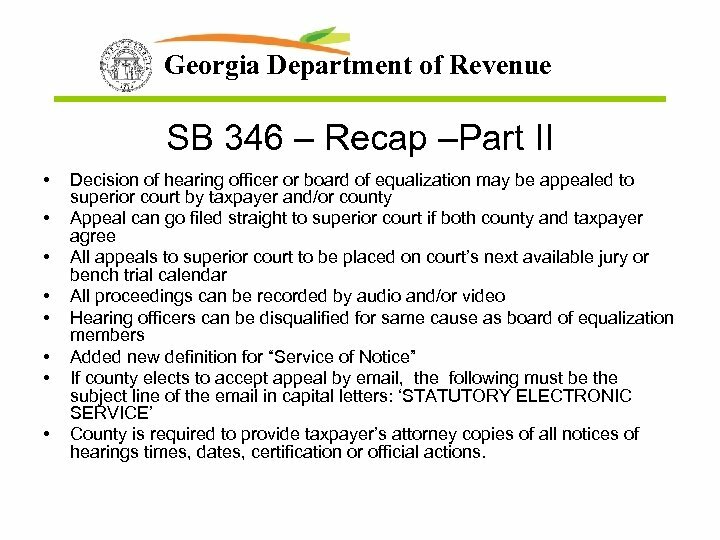 Georgia Department of Revenue SB 346 – Recap –Part II • • Decision of hearing officer or board of equalization may be appealed to superior court by taxpayer and/or county Appeal can go filed straight to superior court if both county and taxpayer agree All appeals to superior court to be placed on court’s next available jury or bench trial calendar All proceedings can be recorded by audio and/or video Hearing officers can be disqualified for same cause as board of equalization members Added new definition for “Service of Notice” If county elects to accept appeal by email, the following must be the subject line of the email in capital letters: ‘STATUTORY ELECTRONIC SERVICE’ County is required to provide taxpayer’s attorney copies of all notices of hearings times, dates, certification or official actions. 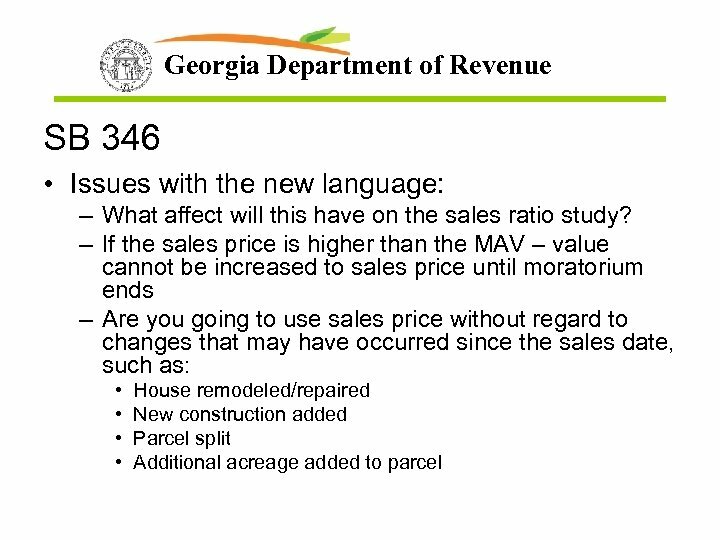 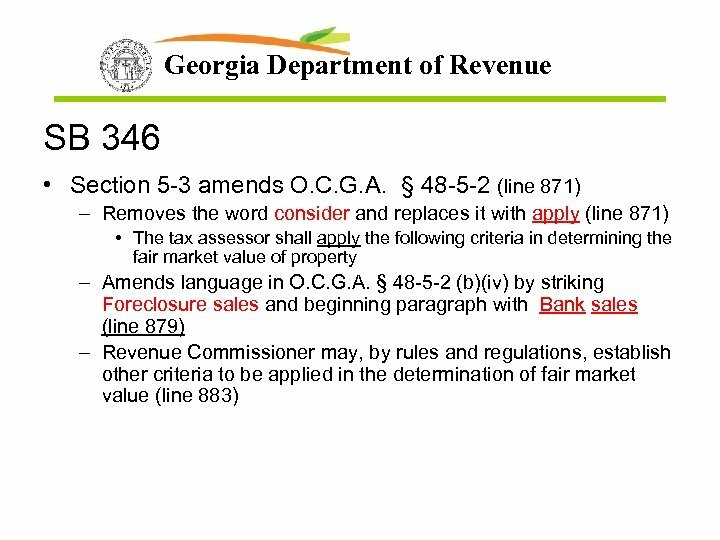 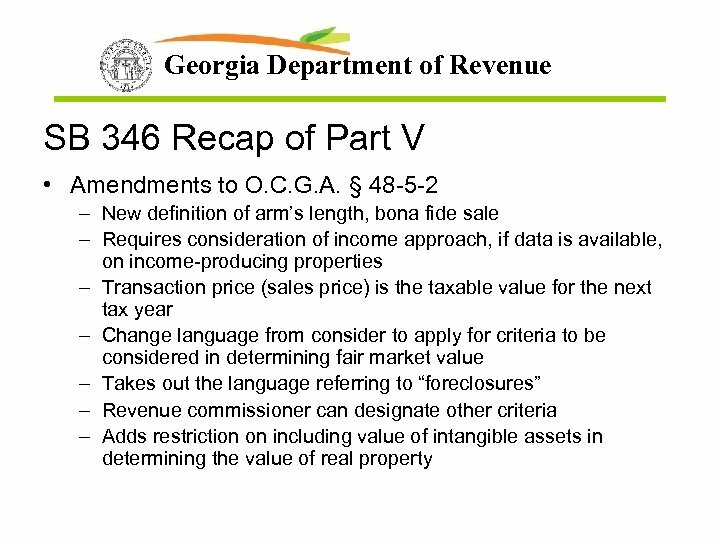 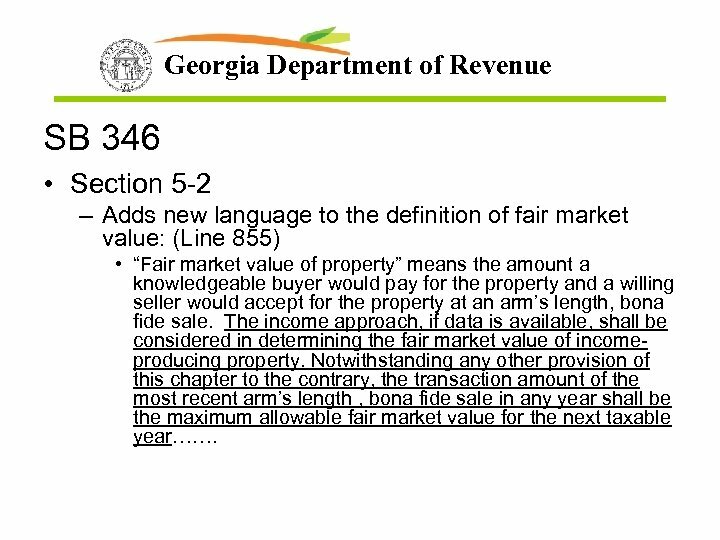 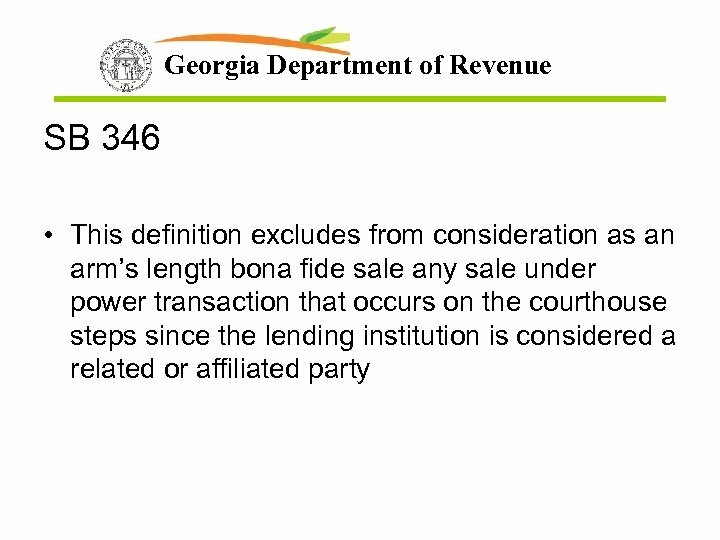 Georgia Department of Revenue SB 346 • Section 5 -2 – Adds new language to the definition of fair market value: (Line 855) • “Fair market value of property” means the amount a knowledgeable buyer would pay for the property and a willing seller would accept for the property at an arm’s length, bona fide sale. 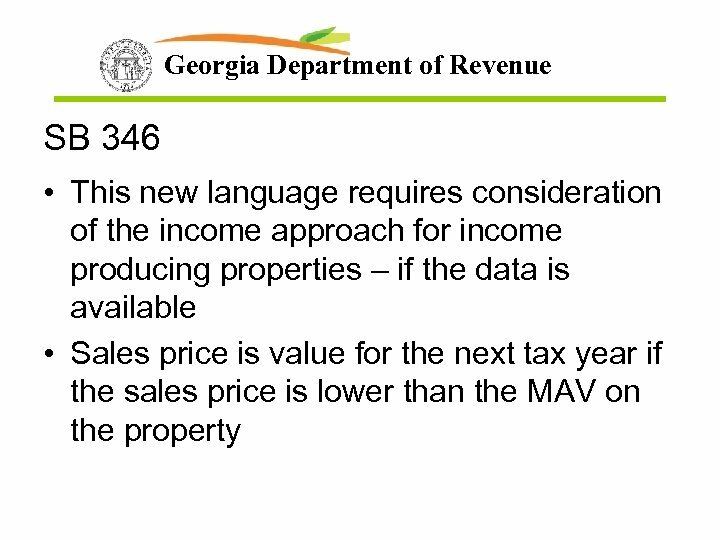 The income approach, if data is available, shall be considered in determining the fair market value of incomeproducing property. 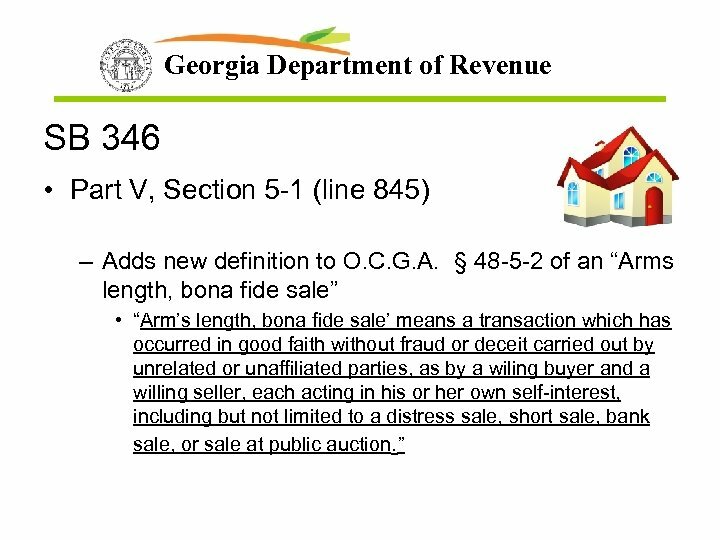 Notwithstanding any other provision of this chapter to the contrary, the transaction amount of the most recent arm’s length , bona fide sale in any year shall be the maximum allowable fair market value for the next taxable year……. 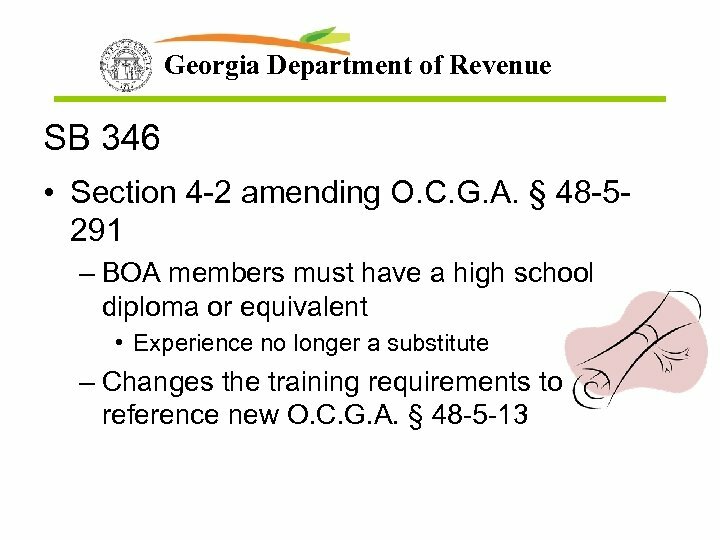 Georgia Department of Revenue SB 346 • Section 5 -4 (line 888) – Further amends O. C. G. A. 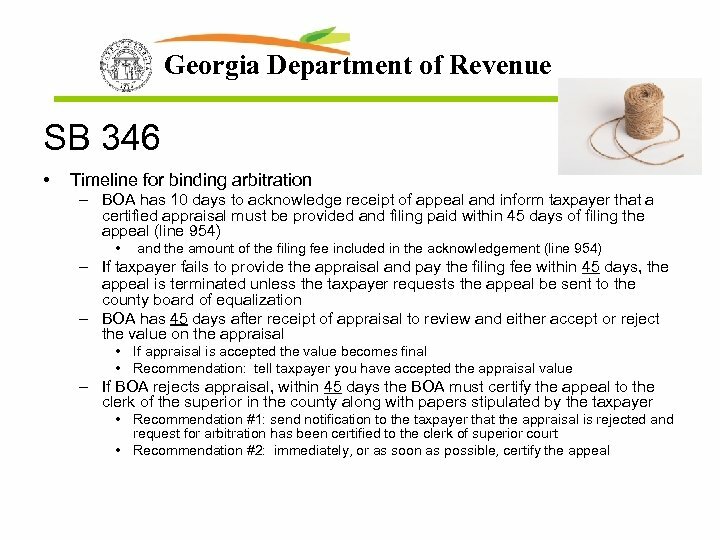 § 48 -5 -2 by adding a (B. 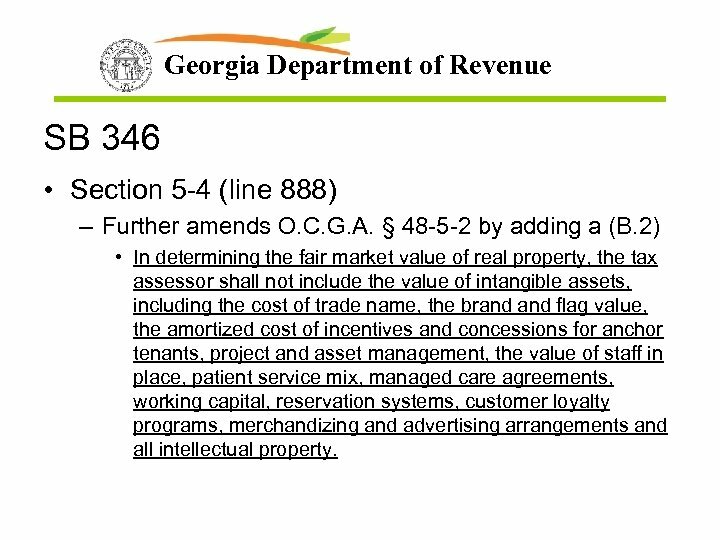 2) • In determining the fair market value of real property, the tax assessor shall not include the value of intangible assets, including the cost of trade name, the brand flag value, the amortized cost of incentives and concessions for anchor tenants, project and asset management, the value of staff in place, patient service mix, managed care agreements, working capital, reservation systems, customer loyalty programs, merchandizing and advertising arrangements and all intellectual property.